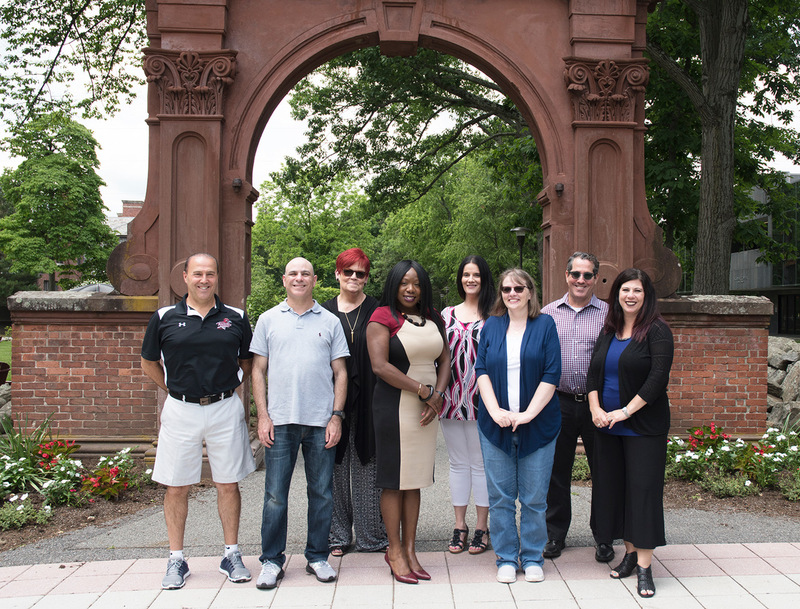 The President’s Staff Recognition Program recognizes excellence and extraordinary effort demonstrated by full-time and part-time non-temporary Ramapo College employees (non-faculty). Review our award recipients over the years. Awarded to a Ramapo College staff member who, in that year, assumed a leadership role and successfully effected positive change. Awarded to an individual or recognized group that, in that year, provided exemplary service to college constituents. Awarded to a group of three or more staff members from at least two college divisions who achieved a significant outcome or completed a significant project. The Team Project Award is focused on recognizing collaboration across units/departments. In that spirit, staff members from at least two divisions must contribute to the team project. The Divisions of the College are: Academic Affairs, Administration & Finance, Enrollment Management & Student Affairs, and Institutional Advancement. Completion of a significant outcome or project in support of one of the four strategic plan goals: (a) Advance Academic Excellence & Engagement, (b) Enhance Financial Strength & Institutional Sustainability, (c) Improve Internal & External Relations and Communications, and (d) Cultivate & Support Diversity & Inclusiveness. Team Composition: The team will have reflected the diversity of the college. Project Award Example: A project completed by staff from Human Resources, ITS, and Events & Conferences would qualify because the units represent the three divisions. A project completed by Admissions, Residence Life, and Student Conduct would not qualify because all of the units are within the Enrollment Management & Student Affairs Division. ** Once an employee is recognized for a President’s award, he/she is ineligible to be awarded for five years. **Within the five years, individual award recipients shall not be excluded from being recognized as a member of a group or team (Staff Excellence in Service and the Staff Team Award). Also, members of the Staff Team Award are eligible for individuals awards within the five-year time period. Nominations may be made by students, staff or faculty members. Employees may nominate themselves. Nominations may be submitted electronically via the Employee Recognition Website form or turned into the Office of Human Resources. Applications must be submitted by Friday, April 26, 2019. The review period is the previous twelve months. Applications are available online and in hard copy in the Department of Human Resources. Would you like to nominate someone for an award but would like some support in authoring or submitting the nomination form? No problem, contact any Committee member (see below) and we will provide you with assistance! All nominations are reviewed by the President’s Staff Recognition Program Committee. The Committee is appointed by the President. Nominations are confirmed confidentially and as needed with unit supervisors/division heads. The committee makes final recommendations to the President, who then makes the final selection. Committee members are not permitted to submit nominations for awards. Committee members shall maintain the confidentiality of all nominations. Committee members nominated for Staff Leadership or Staff Excellence awards shall have the option to decline the nomination or shall recuse themselves from committee service. Committee members nominated for the Staff Team Project Award shall recuse themselves from voting on Team Award nominations. Award recipients serve on the selection committee the following year. Individual and group/team recipients will be recognized with a personalized inscribed plaque in addition to having their name inscribed on a college-wide plaque that will be displayed on campus. Recipients will be announced at the Annual Picnic, with formal presentation at the June 2019 Board of Trustees meeting. Individual and group recipients shall receive a summary of their nominations/noted contributions in the form of a letter from the President copied to their personnel file. Recipient names and photos will be included on the Web. Individual and group nominees shall be notified of their nomination after the award recipients are announced. The program is reviewed annually based on the availability of resources and the merit of the nominations. Winners were announced at the College Picnic on May 24 and will be additionally recognized by the Board of Trustees in June. This Award is presented to individuals that provided exemplary service by fostering cooperation, collaboration and open communication among college constituents. This Award is presented to individuals for assuming a leadership role and successfully effecting positive change. This award is presented to a group of employees who achieved a significant outcome or completed a significant project. It is further focused on recognizing collaboration across the College’s units/departments.